The company through which we organized today’s white water rafting trip told us that we’d be picked up at our hotel at 6:30. We assumed this meant in a car. But we were wrong. The man who picked us up was on a motorcycle and indicated to us that we should walk down the road to Chettripati Square. So we figured that the car was either there, or at Mark and Laura’s hotel right around the corner. When we got to the square, Mark and Laura were waiting there with a guy named Krishna who was holding our lunches. The dude on the motorcycle honked and drove away. We looked at Krishna and said, “Where’s the car?” and he said, “No car. We take the bus.”. Well, now this is all starting to come together. When we’d stopped by the rafting place yesterday, there was a bit of confusion as to what time we were being picked up and someone told us that we should be at the bus station by 6:30. After we had reflected on this a bit longer, we realized that no one ever actually SAID that we were getting a RIDE to the river. Only that we were being “picked up” at the hotel. So we looked at each other, shrugged, and followed Krishna through the streets of Kathmandu to the bus station on Kanipath Road – about a 10 minute walk. Krishna got us tickets on the bus, which was sort of a touristy bus with high-backed chairs and cushions. At 7:00, the bus left the bus stop and drove out of Kathmandu. The drive was about 3.5 hours long, and we stopped a few times to let someone off or to pick up more passengers. But all in all it was an uneventful trip. We stopped within the last hour at a restaurant to stretch our legs, use the loo, and grab a beverage. When the bus started up again to leave, we got on and noticed that Krishna and his fellow rafting guides were not on the bus. So we mentioned this to the “conductor” who pointed to the ceiling. Krishna and his friends were riding on the roof of the bus for the rest of trip, which last about 40 minutes. I had my book “Touching The Void” by Joe Simpson which Mark and Laura had both read. So every once in a while Mark would stick his head over the seat and say “Which part are you at?…. Oh that’s a good one….” and would tease me about what was coming up next. This book is so good and so descriptive about mountain climbing that my hands were sweating as if I were on the mountain with them! We arrived at the river at 10:30, and had to wait another hour or so for them to inflate the rafts and get our helmets and life jackets in order. At 11:15, Krishna gave us our briefing and list of commands: All forward; right forward, left back, all back, etc…” then we were ready to hit the river. 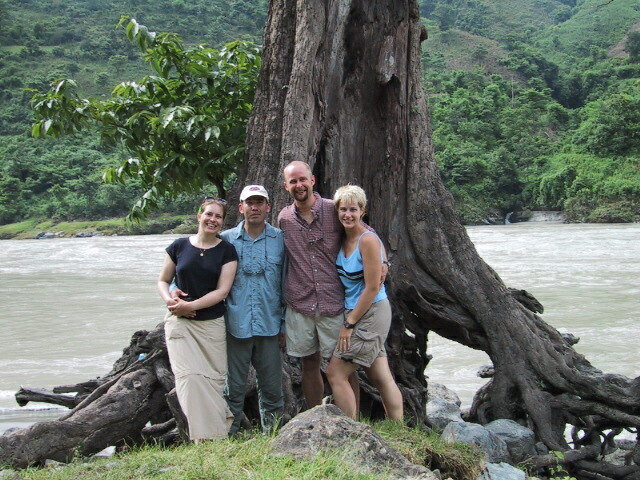 The four of us were in an raft with Krishna, an assistant guide, and 3 guys from Spain. I think that Jon and I were the only ones who had been rafting before, so we sat in the front of the raft. But it didn’t really matter because these rapid are only Class 3 rapids so anyone can do them. There were two other rafts that left the shore with us, each with about the same amount of people but the current put a lot of space between the 3 rafts which was nice. It took us a short while for everyone in the raft to get comfortable with the commands and the feel of the rapids, but we were cruising down the river in no time and having a blast. The scenery was incredibly beautiful, and the mountain run-offs created some gorgeous waterfalls into the river. I wish I could have taken out my camera and taken some pictures, but we were hitting white water every 4-5 minutes so there really wasn’t enough time. After an hour and half of paddling, rafting, and shouting “Woohoo” on the bigger rapids, we pulled over to a beach for lunch. Well, first Krishna tried to land us on a rocky bank but we looked at him like he was crazy and asked for a soft, sandy beach. So 5 minutes downriver we paddled over to a nice beach and settled into our box lunches. The lunches were pretty heinous. There was a box of mango juice, a hard-boiled egg, some fried vegetable concoction, a cole-slaw sandwich, and a cheese sandwich that Mark called a “rubber sandwich”. But we ate as much as we could, and were happy that we brought some chocolate bars with us. Unfortunately, the chocolate had melted so Jon held them in the river for a few minutes until they cooled down. We set off again at 1:00 and continued down the river. This time, Mark and one of the Spaniards sat in the front of the raft so they could have some fun too. I didn’t realize how hard it was to paddle in the front until I was no longer there. This paddling thing is a piece of cake! We passed under a lot of suspension bridges on the river. Some of them looked like they had been there for 100+ years, but people we still walking on them! At one point, we passed a zip wire with a rusty cargo basket hanging below it. A little man was pulling himself across it and was about 1/4 of the way when we rafted under him. What a commute, right? After our last big rapids, Krishna told us we could go for a swim so a few of us jumped in the freezing cold water. The current was really strong, but the raft was moving with us so the only issue was getting back into the raft. This proved to be the funniest part of the trip. The Spaniards had a difficult time because they weren’t little guys, and we all laughed each time they tried to climb on without any help. They would simply slide back into the water again. When I came to climb on, Mark and Laura reached over to grab me by the life jacket to haul me in. This was all done none too gracefully and for a few minutes I looked like a wet fish flopping around the raft as I tried to get right-side up again and we all laughed hysterically. Someone smacked me on the behind just for effect! A short while later, we paddled over to our final stopping point and carried the raft up the shore. We had brought a change of clothes, and took care of changing and getting dry again. We then climbed to the top of the hill where we had to wait for a bus to Kathmandu to drive by. The road that runs along the river is the only direct road from India to Kathmandu, so buses drive along every few minutes. The trick is to find one that (1) is heading to Kathmandu, and (2) has room for all of us. 20 minutes and 5 false calls later (most buses didn’t have room for us), we finally got on a bus and were on our way by 4:00PM. This bus was not nearly as nice as the bus we had on the way out of Kathmandu. Most of the seats were broken and permanently in the upright or fully-reclined position. Laura was in a seat that was stuck upright but the seat in front of her (where I was sitting) would only fully recline. So the poor thing had no room. Jon and I were sitting on top of the wheel well, so our knees were jammed into the seats in front of us. Unfortunately, the sun was setting so we couldn’t read for much longer. The bus was driving excruciatingly slowly, and we were often passed by other buses full of people. We were all dirty, tired, uncomfortable, hungry, and getting more and more impatient by the minute. After 3 hours, the bus pulled over for its 20-minute restaurant stop and we realized that we still had a good hour to go. This bus was SO SLOW! None of us were really thrilled by the prospect of another hour, but neither did we have much choice. So around 8:00, when we pulled into a bus stop close to Kathmandu, we were ready to get out and catch a taxi into town. Unfortunately, there were no taxis to be found. But there WERE touts who climbed on the bus to say “Welcome to Kathmandu!” and tried to get us to stay at the hotels paying their commissions. This lasted for about 10 minutes until all of us in the back of the bus lost our collective patience. We started yelling for the bus driver to drive on and for the touts to get off the bus. Finally, we were on our way again. 10 minutes later, we made another stop where we actually saw taxis. It was pouring rain by this time, but the 4 of us raced off the bus and climbed into a taxi and told him to take us to Thamel in Kathmandu. Ironically, we went from the slowest bus in the country to the slowest taxi driver in the country. At one point, Laura said “Do you think he knows how to get out of second gear?”. Just like New York. When you’re hungry and want to get somewhere fast – you get the only defensive driver in the city. We made it to the restaurant – “Fire and Ice” – to which Jon and I had been yesterday for lunch and which has some of the best pizza in Kathmandu. Yesterday, we split a calzone because they are so big. But tonight, we were so hungry that Jon and I each ordered our own. Laura and Mark each ate a pizza, too. And although the last 4 hours were painful and annoying, the yummy food and cold beers made us happy. We felt much more relaxed as we left the restaurant, despite the pouring rain and cold air. Luckily, there were taxis right out front so we took a taxi to the short distance to Chetripati Square near both our hotels. The four of us ducked under an overhang to say our goodbyes because Mark and Laura a leaving for China tomorrow morning. We’re so sad to see them go because we all got along so well, but I’m sure that these are people we’ll see again sometime! Jon and I ran through the rain to the hotel, where we each showered and washed our wet river clothes. (Yes, doing laundry in the shower is a very efficient use of time and water!). Then we curled up in bed and read. I had to stay up until midnight to finish my book – it’s that good!